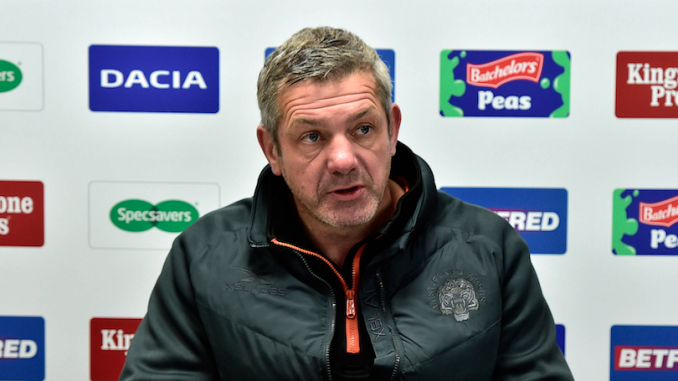 Castleford coach Daryl Powell heaped praise on his forwards following their win over Warrington. The Tigers beat the Wolves 28-18 at the Mend-A-Hose Jungle on Friday night to move up to third in the Super League table. Castleford are now two points above fourth-placed Warrington and Powell was pleased with his side’s performance. He said: “Our pack was outstanding and they really stood up against Warrington who are a big physical unit. “Warrington defend really well on the edges and they put you under pressure so you have got to find different ways of getting over the line and we started to do that in the second half and some smarts bit of play got us points. “We were good for large parts and we controlled the game in the first half and dominated the game. Powell wasn’t pleased with a couple of individual errors in the game though. He added: “I thought we were pretty good, apart from our start to the second half when we were a bit loose. Next up for the Tigers is a game against Catalans Dragons at the Mend-A-Hose Jungle on Saturday, September 1.